This week’s list comes from the incomparable Courtney Barnes of Style Court. I am a huge (huge) fan of her blog, as well…frankly she pushes me out of my comfort zone. Her take on traditional decor is fresh and young (which is something you don’t always see.) She has amazing taste and her infinite knowledge and passion for design is completely inspiring. Plus the lady can wrap a killer gift. 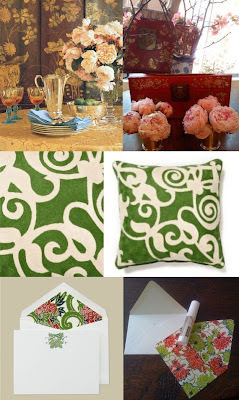 Herewith Courtney’s design favorites. Enjoy! Fresh flowers juxtaposed with painted ones. Peonies and flowering branches are my personal favorites. They are precious because they are not readily available -- or at least quite costly when they are for sale at a market or florist's shop -- so I only have them a couple of times per year and really appreciate them. To me, when mixed with a painted Asian screen or box, they are stunning. For some reason I never tire of Anthropologie's Isola Bella pillow. It's like a modern take on classic crewelwork, it's graphic but not too trendy, and the store has interpreted it now in quite a few color ways. Currently I'm obsessed with the green. Envelopes lined with exquisite paper. Stationery from Mrs. John L. Strong is among the most beautiful in the world but to save money, and for fun, I like to line my own envelopes with Japanese paper bought at an art supply store. 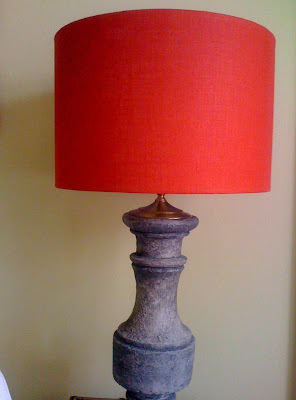 I just have a thing for red linen lampshades. They add so much warmth to a room. 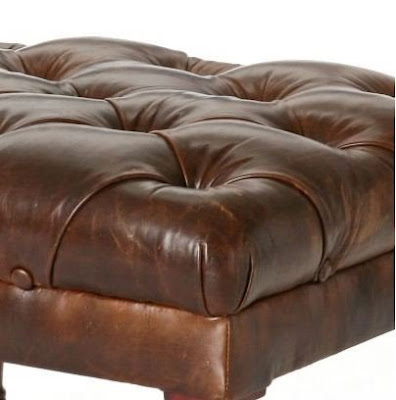 Rich button-tufted leather never goes out of style. Ottomans like this are kid-friendly and great in a small space because they can do double duty as seating and coffee table. I always end up using any sort of bench to hold stacks of books. 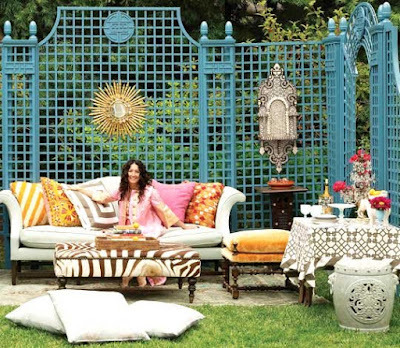 Classic English camelback sofas mixed with global influences -- Indian textiles, Chinese ceramics, something African -- always appeal to me but this outdoor fantasy created by Windsor Smith is to die for. 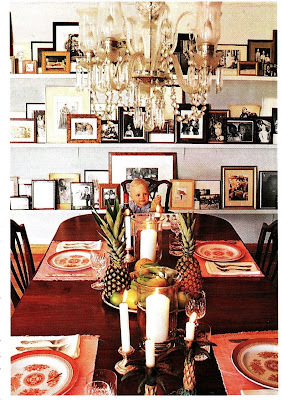 India Hicks' dining room shelves laden with family photos sort of break the rules -- many designers say they don't care for family pictures in living and dining rooms -- but I think her arrangement is stunning and I've been holding on to this tear sheet from Vogue since about 1997! Porches with robin's egg blue ceilings (image via here) and a gardenia floating by the bed like this one via interior designer Schuyler Samperton. 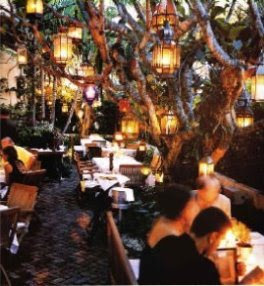 That outdoor space is to die for... can you imagine having a space like that? So fun to see you yesterday, so glad we finally got to meet! Yes, we definitely need to get some wine and do a little decorating! Can't wait! Josyln! I just got in. Thanks so much. I'm very, very flattered and I love how you put this together. It was fun. I just want to jump up and down with joy at all these lovely favorites... That India Hicks article from Vogue WAS a an absolute winner! Mrs. John L. Strong stationary... oh happy sigh. Red silk lampshades? Yes definitely! And lanterns in trees, indeed!! Really beautiful. I always love seeing new installments in this series. Please oh please, will you tell me where the ottoman is from? 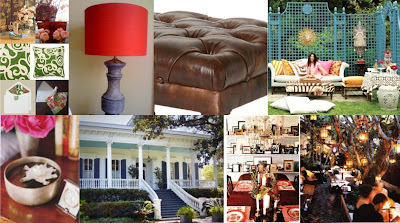 What a fabulous round up of 'must haves'! I love the idea of customizing your own envelope liners--so civilized and expressive, all at the same time! And peonies + flowering branches? Swoon! Thanks for a fabulous post, Joslyn and Courtney! What an incredible artist! I'm so intrigued! Thank you for the lovely selection of photos - I was particularly cheered by the beautiful blues (and of course lovely pure white gardenia) of that wonderful porch!